The U.S. Mint has released several new products today, including two versions of the 2016 Mark Twain Commemorative silver dollar, and rolls and bags of the 2016 Shawnee National Forest quarter. The introductory pricing period for the 2016 Mark Twain silver dollars runs until March 2, putting the cost of the Proof coin at $45.95 and the Uncirculated version at $44.95. After that, the Proof issue will be priced at $50.95 and the Uncirculated coin will cost $49.95. 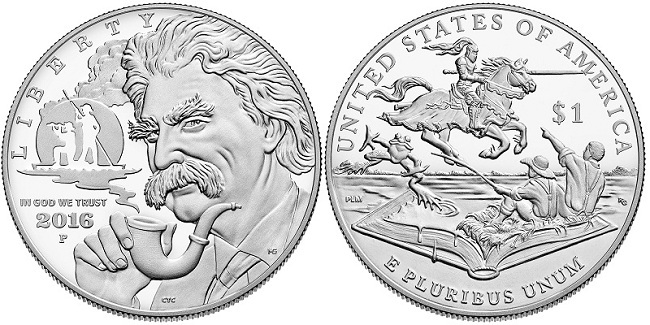 The obverse of the silver dollar, designed by Chris Costello and sculpted by Michael Gaudioso, carries an image of Mark Twain smoking a pipe. The smoke rises to form a silhouette of Huck Finn and Jim rafting the Mississippi River. Inscribed along the left side of the design are LIBERTY, IN GOD WE TRUST, and 2016. The Philadelphia Mint’s “P” mint mark is also included in the field. The reverse design also features Huck and Jim, along with images of a mounted knight from A Connecticut Yankee in King Arthur’s Court and the jumping frog from The Celebrated Jumping Frog of Calaveras County. Inscribed along the rim are UNITED STATES OF AMERICA and E PLURIBUS UNUM, with the coin’s $1 denomination located in the field nearby. This side of the coin was designed by Patricia-Lucas Morris and sculpted by Renata Gordon. 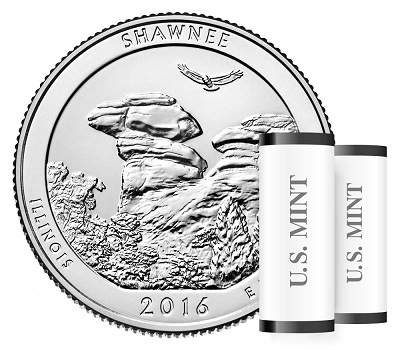 The Shawnee quarter is the first America the Beautiful issue of 2016 and is available in six product options offering varying quantities of the issue from the Philadelphia (P), Denver (D), and San Francisco (S) Mints. Collectors can purchase bags of 100 quarters with P,D, or S mint marks for $34.95. Additionally, a forty-coin roll (S) can be bought for $18.95, a two-roll set (P and D) costs $32.95, and the three-roll option (P, D, and S) is available for $46.95. The coin’s reverse features a red-tailed hawk soaring over Camel Rock, with the inscriptions SHAWNEE, ILLINOIS, E PLURIBUS UNUM, and 2016 placed along the rim. The designed was created by Justin Kunz and engraved by Jim Licaretz. The obverse includes John Flanagan’s 1932 portrait of George Washington, along with the inscriptions UNITED STATES OF AMERICA, LIBERTY, IN GOD WE TRUST, QUARTER DOLLAR, and a mint mark. The Shawnee quarter will get its official launch ceremony on Thursday, February 4, at 10 am CT in Harrisburg, Illinois. For more information on the U.S. Mint’s newest releases, please visit its Web site.